Welcome to the Las Vegas VIP Packages page. With over 10 years of experience in group event hosting, our staff of VIP party planners has put together some popular options and packaged them for the most attractive prices. Our package options have been separated into categories that cater to some of the more popular groupings. 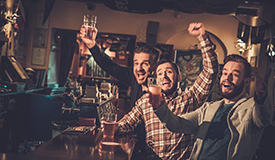 Bachelor party packages are set up with activities, generally, more interesting to guys such as gun range shoots, gentleman's clubs, huge SUV limos and of course the hottest nightclubs for partying the night away. Our bachelorette party packages have a more feminine feel to them with options like trendy dinners at fun, upscale restaurants, pool parties, dance clubs and of course male reviews. The Highroller section is for the group that is not afraid to flaunt their earnings on a night out on the town that is second to none. Other genres include birthday party packages, divorce party packages and even recession party packages. Hey, even people on a tight budget need to party like its 1999,…..literally. This VIP Package page has a little bit of everything, so look around and if you don't see what you like, just click on our Custom Party form for a personalized package that will fit your needs and price range. Even easier, just pick up the phone and dial 1-800-VEGASVIP and one of our VIP specialist will be happy to help. Las Vegas is quickly becoming the place to be for that last big bash before marriage. The celebration to end all celebrations. The final gathering of good friends from all walks of life to one fantastic place in order to purge the last temptations of single life before walking down the aisle. Yes, the bachelor party ! . Las Vegas is the mecca for this type of event. Top nightclubs, flashy limos, awesome weather and, of course, the wildest stripclubs. They don't call this "Sin City" for nothing. Vegas VIP specializes in group parties, such as bachelor party or bachelorette parties. Our knowledgeable staff of bachelor party planners knows how to throw the perfect Las Vegas bachelor party, VIP style. The ideal bachelor party Las Vegas consists of four things. First the evening should start out with "the last supper". This is a meal amongst friends that includes a lot of toasts and a good amount embarrassing stories. It is also advisable to eat a good dinner before a long night of drinking. Second is the transportation. A super stretch limousine or fully loaded party bus is the only way to roll. It is well worth the money to bypass the long taxi lines and show up everywhere in style. Third is the nightclub. 7 of the top 20 nightclubs in America are all located here in Las Vegas. Due to this fact, the lines to get into these hotspots are in some cases 3 hours long. This is especially true for a large group of guys, unless of course you are a Vegas VIP client! The fourth key to a memorable bachelor party is the stripclub. For the guys, Vegas VIP has exclusive access to the city's top gentlemen's clubs. This includes no line VIP entry and preferred seating. As for the bachelorette parties, we offer a range of choices from male review stage shows to a full blown lady's stripclub.